Here you will find a variety of porcelain clay bodies for potters and sculptors. These porcelain pottery clay bodies are made from domestic kaolins or imported English Grolleg. These moist porcelain clays for pottery are carefully formulated and tested to deliver excellent and consistent results in their firing range. Explore our selection of porcelain clay for sale today! Be sure to check out our new Elaine's Crystal for our finest pottery porcelain body ever. It is available as Elaine's Cone 10 for gas fired and wood kilns or Elaine's Cone 6 if you fire electric kilns. "Working with porcelain is constant quest to balance translucence and plasticity. Sheffield Pottery's Elaine's Crystal is the by far the best I've found." 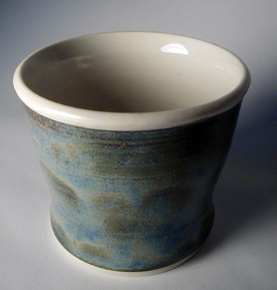 Price per box decreases as you order more porcelain pottery clay. Use the "View Quantity Discounts" button to see price per box discounts. The discount is also shown your shopping cart where you can change your desired quantities of each clay to fine tune your order. If you order one 50lb box of Mass White and one 50lb box of Mass Red, you are given the discounted 100lb bracket for both boxes. This savings will be shown in your shopping cart. In your cart you can change your desired quantities of each clay to fine tune your order. NOTE: The prices below do not include shipping. Use this pricing for orders of 1000 pounds or more. Give us a call to quote on freight. NOTE: We now offer Delivered Prices online for super easy and simple ordering of quantities less than 1000 pounds anywhere in the USA including Alaska and Hawaii ! Click Here to see quick and economical "Easy Way to Buy Clay" Delivered prices !